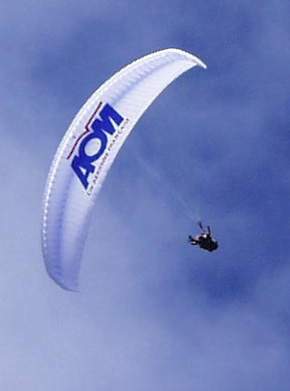 Simply in a class of its own, it is the best tandem glider in the skies by unanimous vote of the top industry critics. Representing a new revolutionary step in tandem flying, it is the first time you will find a tandem machine which can handle and perform like a solo glider. Real fun and performance combined with remarkable safety and launch characteristics make the Futura for Two the ultimate tandem machine for both the profetional pilot, record seeker or recreational pilot. Available in two sizes: 42 and 38. The 38 is also certified in performance class as a "solo glider", especially for big men, who have beem discriminated against for lack of a suitable product. Futura for Two - twice as much Fun.